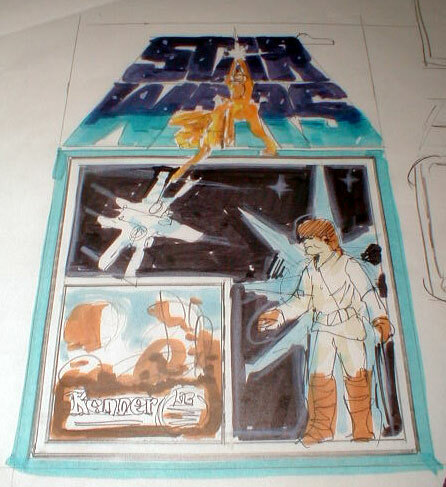 Kenner had an outside design firm aid them in the creation of their Star Wars blister cards. The images you see on this page show a sketch dating from the earlier stages of this design process. 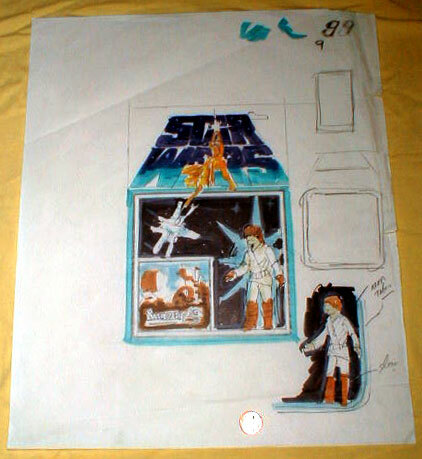 As you can see, it features the "crawling" version of the Star Wars logo, a version that appeared on quite a few licensed products during the late-1970s. Here's a closer view. As you can see, the logo features a colorful blend of blues. Actually, blue is the predominant color of the sketch, being present in the figure area as well as around the border of the blister card. A still closer view. 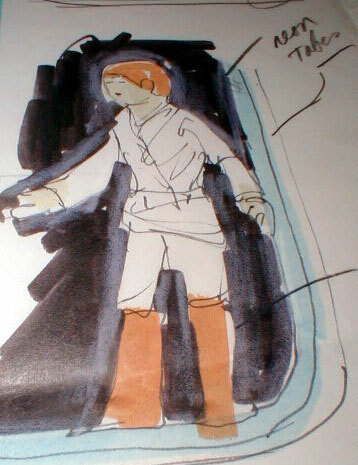 The image of Luke, based on the conceptual model of the figure seen here, is supposed to represent the action figure as it would appear on the card, not a printed image. The area on the card directly behind the figure is occupied by a blue star. This probably is an upshot of the concept sketch for the blister card back seen here, which utilizes a system for identifying figures that's based on color-coded stars. Also note the presence of the Kenner and "Long Play" logos towards the lower left corner. This is the only one of these sketches that includes these details. These logos are located in a smallish square, which I think was meant to feature some kind of character-specific photo, possibly a shot of Luke on Tatooine. 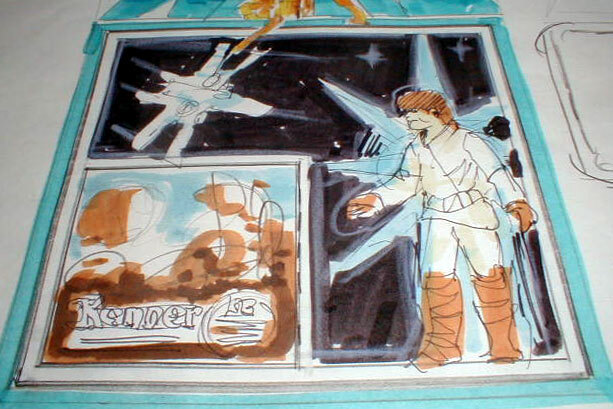 The background, featuring an X-Wing soaring against a starry background, was probably envisioned as being standard throughout the line. Here you see the main logo. It's pierced by a rather large variation on the Luke-and-Leia logo made famous by the Hildebrandt brothers. As you well know, this logo did end up being featured on the 12-back blister card; it was simply reduced in size and moved to the left of the Star Wars emblem. Finally, here's a close-up of the inset which appears in the lower right corner. I believe this is an alternate idea for the figure area. 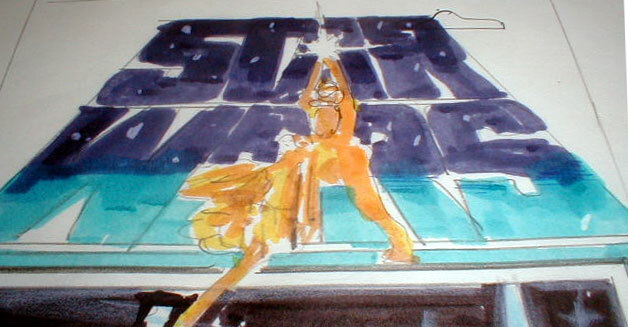 As you can see, a pencil-drawn note refers to the blue border around the figure as emulating "neon tubes," an idea that is probably related to the steel-like bars which appeared on the finished product. In place of the star background is a simple light-colored glow. There is also a note which refers to this, but it's not visible in this photo.